Writing/Journalism – I was a late bloomer and we had a group project to make our own newspaper and I really enjoyed the work we put into that project and if I recall it was only 2 of us who was actively working on the project. I discovered the love for writing but I hesitated to pursue this given that there is no money in writing. I was also scared of the risk involved in investigative journalism as I was keen to pursue that with the influence of media personalities at that time who will risk life and limb just to cover a hot story. Psychology – I was a good listener, or at least I felt I was, to friends and my Mom who were in need of a listening ear, a shoulder to lean on and just be present during trying times. At times, I would also interject questions or give a contradicting statement or be a devil’s advocate to make the person see the problem from a different perspective or from a bird’s eye view versus being in the middle of the whirlwind. Again, I hesitated given that there is no money and I was also thinking what can be my potential career which during that time I can only think of 2: a teacher or a guidance counselor. Also, at that young age, I cannot distance myself away from other people’s problems and I would literally feel completely drained like the life being sucked away from me after a heart-to-heart session. Electronics and Communications Engineering (1st choice) or Chemical Engineering (2nd choice) – I enjoyed our mini project in High School of assembling a small thingamajig that I can’t actually remember now after x number of years. 🙂 I liked the intricacy of soldering the capacitors and resistors and after putting it all together, the exhilarating feeling of seeing that the thingamajig is working. This is a major course that is has a high enrollment rate and it has a tendency to be filled up fast. So, the interest was there and I was thinking Engineers are paid very well so I applied for entrance examinations for this course. Fortunately or unfortunately, it depends on how I look at things now, the whole family was bogged down by chicken pox so I was not able to enroll immediately in UST and when I got a chance to go to UST all the slots for ECE was filled up and I had to settle for ChE. I was thinking that the first 2 years anyway are general subjects that I can shift to ECE later which I never did do when that time came. So in that pivotal moment in my life, I decided to take up Engineering as I didn’t want to pursue my passion because there is no money in it becoming a writer or psychologist. I never got to use the knowledge acquired in Chemical Engineering in my job though it was a stepping stone for me to get in to the job because the company was hiring Engineers. From day 1, after the on-boarding process and rigorous training, I took on a Supply Chain role and until now. The discipline and the structured thinking of Engineering is the one that helped me in Supply Chain especially in implementing projects, thinking out of the box and exploring and implementing new things. I’ve been managing people, but I prefer to call working with people, for 3+ years now and you can call me a reluctant manager as I prefer to be an Individual Contributor and though I did a good job leading a Warehouse Team in my previous lifetime, the whole calibration thing made me disillusioned about managing a team. When I lead people, I am invested in their growth and change for the better so it pains me when others are not able to see it. So, I become emotionally attached, maybe too attached for my own good. Ok, going back to the present, as a people manager, we need to do a lot of write ups about our team, our projects, and the people that we manage especially for the whole performance management process of writing what have they done well, what is not working well and the path forward. I must admit that I do spend a lot of time assessing, reflecting and writing about each individual’s performance. Also, we do 1 on 1 meetings and listen to the challenges of our team and asking them how can we help them. I don’t talk about just work with my team but also about aspects of their life because I want them to be successful in all aspects. If one area of your life is not doing well for sure it will impact all the areas. No matter how much we say that we will leave the personal problems at home, for sure it is still nagging us in the back of our minds. So, whether we like it or not, the reality is we need to understand our team members, get to know them on a more personal level, though challenging for low “I” people like me but I do intentionally work on it but it is a journey. By understanding them and knowing them better, we will be able to adjust and adapt our leadership style with them, we will be able to motivate or guide them in a better way because we know what makes them tick and what is in their hearts. What’s hilarious now is that I put up a blog site for me to continue pursuing my passion for writing and spending time to learn more on how to improve this craft. What’s more hilarious is that recently I have asked someone that I met last year but didn’t really spend much time with, if she wanted me to help her out, share my own learnings and experience and try to mentor her to achiever her best self. I saw something genuine in her that she really wants to get out of the mediocre box because she wants and she knows that she can do so much more. 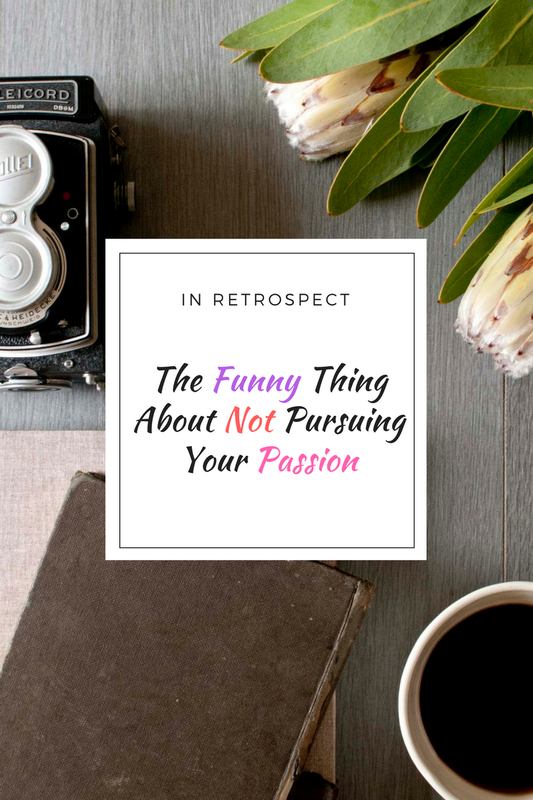 In retrospect, yes, I didn’t want to pursue writing or psychology but life has a funny way of bringing or even throwing your passion back to you when you consciously have avoided or have been avoiding that passion. And here is the thing, because it is your passion, it doesn’t feel like its work. You feel happy and energized doing it. The best thing about this, is the feeling of making a difference in other people’s lives that you have transformed their life but in the process your life also gets transformed. The morale of the story: No matter how hard you try to hide and avoid your passion, because it is innate in you, it is inherent in you, it will find a way of just getting out from within you. Being your best self means marrying work and passion together. It is the best of both of worlds that you don’t feel that it is “work” and you will be performing at your peak every day. I had always loved speaking and writing. And I knew from the very start this is what I wanted to do. But then life happens. Detour kung baga. I became an English teacher for about a decade and then a few years after, I came back to my first love and my dream job — to write and to speak. =) Never looked back. Hello fellow Thomasian 🙂 Yes, I was kinda surprised na USTe ka din. Wow! This is an inspirational story and I admire the dedication that you had studying when you were not working. I also like to teach people not just about Supply Chain and work related stuff but more about the soft skills on leadership, etc and of course my passion for the advocacy of promotion financial literacy to Filipinos esp to OFWs and if I have a chance I would want to work with teachers as they have a bigger influence and they touch more youth vs us corporate executives. I can relate to the story. I have always been passionate about writing. I wanted to take up Journalism or Communication Arts in college but I enrolled to IT. Hahaha. I am also a frustrated IT person. But I don’t think I have that patience to attend to tickets raised and complaints issued. I also had journalism as my first choice but eventually decided to take up Accountancy since it’s a safer course. I did succeed in my field and once I was successful, I resumed my blog to continue the passion for writing. I really think it just backfires when you choose something else over your passion. You’re always just stuck with a feeling of what if. Oh I’ve had moments when I’m overwhelmed with the many things I want to do in life but can’t because of choices I’ve already made in the past. Nothing I regret of course! I’d like to believe that all the choices I made are putting me in the path or journey God has planned for me. I have passion in baking, writing, video editing. I love kids, would love to teach someday. So many things! I like writing like blogging and in filmmaking. But not yet when I was about to go to college. IE and pinili ko sa MIT, nag shift aka sa COE, nag stop ako, lumipat ako sa UPOU nag AA, yun natapos ko.Tinuloy ko ng BAMS, nag stop ulit. What’s my story? not yet done. I relate to this because I`ve always liked writing and considered studying journalism, creative writing or English literature. Just like you, many people in my life thought studying in college for these types of subjects is not practical especially if you need money as soon as possible after college. I`m really passionate about what I like doing, which is why I became active in blogging. Blogging allows me to write and be creative.